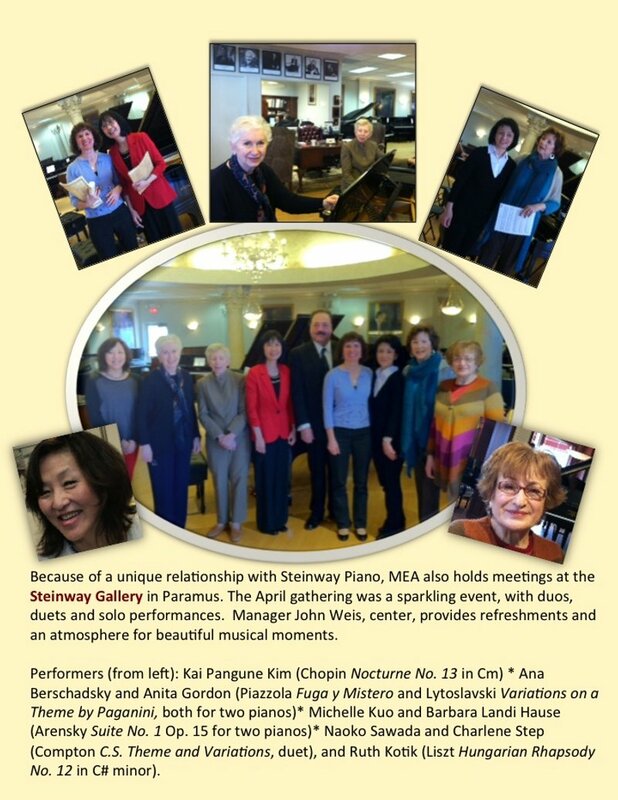 The Scherzo Club provides opportunities for MEA members to meet and share the beauty of music with colleagues and friends. Meetings are held at 10:00 a.m. on the first Tuesday of the month from October through May in friendly and comfortable home settings. Participants are able to try out new pieces for formal or informal performances or for demonstrations to students. Members are welcome to come either as performers or listeners and may also bring friends who are non-MEA members. If you would like to attend, please notify the host/hostess a few days before the scheduled date. To do so, use the Contact Us feature on this website or the Membership Directory for contact information. Check our Calendar Page for full schedule and locations. If you are interested in hosting a future meeting, please email Barbara Landi Hause, Scherzo Club chair at: scherzoclub@mea-nj.org. 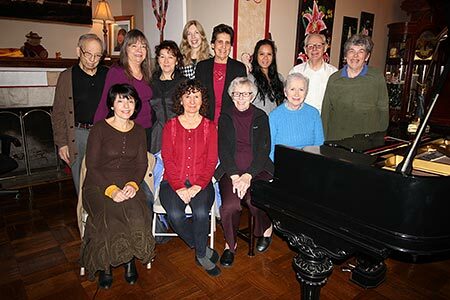 Scherzo Club meetings are held in friendly, comfortable home settings. Standing, from left, are performers Beatrice Long, Bertha Mandel and Cinder LeDell (hostess), with Anna Katznelson and John Blasdale (seated). The music ranged from Bach Preludes to Beethoven Sonatas to Ravel, Rachmaninoff and a Rocherolle two-piano waltz. Lively conversation, lovely cuisine and a passion for music combine to make these get-togethers memorable events.